Domaine l’Or de Line is a new domaine in Chateauneuf du Pape. It was created when the owners of Domaine Saint Benoit parted company and created their own Southern Rhone Valley vineyards. This led to the formation of Domaine l’Or de Line by the combination of the Jacumin and Courtil families. Not only that, but you can also count the creation of Domaine le 3 Cellier, founded by the Cellier family as another winery that came out of the dissolution of Domaine Saint Benoit. The idea for the name of Domaine l’Or de Line, came from the phonetic spelling of Laureline, the young daughter of Gerard Jacumin. Domaine L’Or de Line owns 9 hectares of vines in the Chateauneuf du Pape appellation. 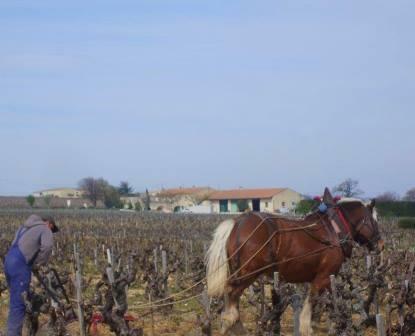 7.4 hectares are used for planting grapes used to produce red wine and the remaining 1.6 hectares are used to produce white Chateauneuf du Pape grape varieties. They have old Grenache vines which are more than 75 years of age. Starting in 2009, Domaine L’Or de Line began using only organic farming techniques in all their vineyards. Domaine L’Or de Line was certified Agriculture Biologique in 2012. Domaine L’Or de Line produces 2 red Chateauneuf du Pape wines and 1 Chateauneuf du Pape Blanc. Domaine L’Or de Line Chateauneuf du Pape is made from a blend of Grenache, Mourvedre, Syrah, Counoise and Muscardin. The terroir is a mix of rocks, sand, stones and clay soils. The wines are aged for 12 months in stainless steel tanks for 18 months before bottling. Domaine L’Or de Line Chateauneuf du Pape Cuvee Claude Courtil is made from the estates Grenache oldest vines. The blend is usually close to 80% Grenache with various percentages of the allowable grape varieties. The terroir is rocks , sand and clay. The vines are planted in the les Galimardes and Palestor vineyards. The wine is aged for 18 months in used, French oak casks. Domaine L’Or de Line Chateauneuf du Pape Blanc is produced from a blend of Grenache Blanc, Picpoul, Roussanne, Bourboulenc, Clairette and Picardan. The wine is aged in tank and both, new and used French oak barrels for 6 months. Domaine L’Or de Line can be enjoyed on the young side. Young vintages can be popped and poured, or decanted for about 1 hour, give or take. This allows the wine to soften and open its perfume. Older vintages might need very little decanting, just enough to remove the sediment. Domaine L’Or de Line is usually better with 2-4 years of bottle age. Of course that can vary slightly, depending on the vintage. In the best vintages the wine should be consumed within 3-12 years after the vintage. Domaine L’Or de Line is best served at 15.5 degrees Celsius, 60 degrees Fahrenheit. The cool, almost cellar temperature gives the wine more freshness and lift. Domaine L’Or de Line is best served with all types of classic meat dishes, veal, pork, beef, lamb, duck, game, roast chicken, roasted, braised, stewed dishes, sausage, barbecue and cassoulet. Domaine L’Or de Line is also good with Asian dishes, hearty fish courses like tuna, mushrooms, cheese, pasta, eggplant and tomatoes. The white wine of Domaine L’Or de Line is best served with a myriad of different seafood dishes, shellfish, crab, lobster, sushi, sashimi, chicken, pork and veal, as well as Asian cuisine. Smoky, dark fruits, lush, polished tannins and freshness are on the nose and palate. The finish feels great with its garrigue, black pepper and dark red fruits. The wine is produced from 80% Grenache with the remainder coming from various other grape varieties. Herbs, olives and sweet, red fruits with a spicy angle, coupled with round, fleshy textures and a fruity finish are what you find here from start to finish. The wine was made from 30% Grenache, 30% Mourvedre, 30% Syrah and 10% Clairette. Smoke and oak are the first notes in the nose, which are soon followed by incense, spice and kirsch. Round, juicy, polished and lush, the fruit is fresh, silky and soft on the palate and in the finish. The blend of herbs and kirsch works here. Medium bodied, bright and almost crisp, the red fruits are accompanied by a generous dose of olives and freshness in the finish. Red fruits and herbs are nicely blended together. The medium bodied wine offers soft textures and a strong olive, tapenade note in the finish that carries through. Smoky red fruits, soft and easy drinking, this should be fun to enjoy the day you bring a bottle home from the store. Silky, lush and long, there is sweetness and depth of flavor in the ripe, spicy fruit filled core. From a blend of 60% Grenache and 40% Mourvedre, the wine reached 15% alcohol. Licorice, fresh herbs, cherry and earth make up the aromas. In the mouth the wine is fresh, open, round and lively. Medium bodied and all about the finesse textures found in the soft, red berries. Produced from a blend of 40% Grenache, 40% Mourvedre, 10% Syrah and the remainder made up of various grapes planted in a field blend, the wine reached 15% alcohol. Medium bodied, finesse styled wine with an herbal quality in the red fruit finish. Drink young. Simple, easy, cherry filled wine that should be enjoyed over the next few years as it does not have the stuffing to age.